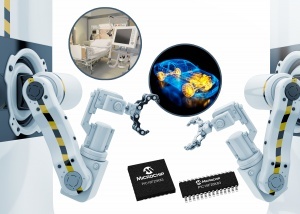 Microchip announces an expansion to the PIC18 product line with a new family of 8-bit microcontrollers (MCUs) that combine a Controller Area Network (CAN) bus with an extensive array of Core Independent Peripherals (CIPs). The CIPs increase system capabilities while making it easier for designers to create CAN-based applications without the complexity of added software. A key advantage of using a K83 MCU in CAN-based systems is that the CIPs provide deterministic response to real-time events, shorten design time and can be easily configured through the MPLAB® Code Configurator (MCC) tool. The new family is ideal for applications using CAN in the medical, industrial and automotive markets, such as motorised surgical tables, asset tracking, ultrasound machines, automated conveyors and automotive accessories. The CIPs enable system designers to reduce time-to-market with fast configuration of a hardware-based peripheral rather than writing and validating an entire software routine to accomplish a task. The PIC18 K83 devices contain 15 time-saving CIPs including: Cyclic Redundancy Check (CRC) with memory scan for ensuring the integrity of non-volatile memory; Direct Memory Access (DMA) enabling data transfers between memory and peripherals without CPU involvement; Windowed Watchdog Timer (WWDT) for triggering system resets; 12-bit Analogue-to-Digital Converter with Computation (ADC2) for automating analogue signal analysis for real-time system response; and Complementary Waveform Generator (CWG) enabling high-efficiency synchronous switching for motor control. For more information on these and other CIPs visit: 8-bit MCU design centre. The new products are supported by MPLAB Code Configurator (MCC), a free software plug-in that provides a graphical interface to configure peripherals and functions specific to each application. MCC is incorporated into Microchip’s downloadable MPLAB X Integrated Development Environment (IDE) and the cloud-based MPLAB Xpress IDE. The family is also supported by the Curiosity High Pin Count (HPC) Development Board (DM162136). The PIC18F25K83 with 32 KB of Flash memory, and PIC18F26K83 with 64 KB of Flash memory, are available today for sampling and in volume production. Each of these parts is available in 28-pin SPDIP, SOIC, SSOP, UQFN and QFN packages.